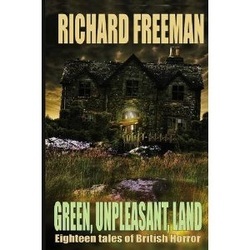 Putting two commas in a title is far from routine, yet the charm of Richard Freeman’s ‘Eighteen Tales of British Horror’ has much to do with his use of familiar forms. The length, approach and structure of almost all of these tales are reminiscent of collections like the Pan Book of Horror anthologies edited by Herbert Van Thal, the pull-the-curtain-back revelation of a monster for each tale is similar to the convention of the TV series 'The Outer Limits'. To accentuate the pre-empted, the monster of each tale is illustrated explicitly opposite the first page of each story. Rather than become caught up in suspense, we are invited to take a cooler, more ‘scientific’ view of proceedings; to engage not with our fears as with our culture, with our places and with the things we share them with. It is no accident that this was published by the Centre for Fortean Zoology. The ‘monsters’ here, despite the wide range of giant, multitudinous and secret things, are almost all recognisable as cast members of cryptozoology’s roll of honour; but it is not quite so simple as that, not quite so scientific. For the real impact of Freeman’s collection comes in its more ambiguous parts, where his tales hover between the physical but unusual, the impossible but material, as much to with immaterial culture as the thing in the Petri dish. Then the homeliness of Freeman’s form falls away and we are invited coolly to face the oppressively organic, the uncomfortably mutable, the folds of a cowl that are fleshy, cave residues that may be mineral, but more probably are not. These monsters come with mythos; the pad of casual hunters gently taps out the rhythm of foaftale, the chanting of the credos of ecological micro-systems that cannot be bargained with. As they accumulate, the flaps and the writhing organs, the whispers, the miasmic swarms of re-telling and the shifts beneath the surface increasingly get under the skin of folk-belief. But there’s another element that makes the tales and particularly drew our mythogeographical attention; their attention to place. It is no accident that in the final tale Freeman explicitly cites ‘genius loci’. For almost every tale here, the monster is the place, and the place is the veil of the monstrous. In one of the most effective tales – ‘WELCOME HOME GEORGE’ – a derelict house without a grim or dread history is given one by the attraction of belief; despite the repetition of ancient survival and hidden evolution, what uncovers, provokes or summons the monsters of these tales are our places and what we do to them: asylums full of batons, abject housing, rivers we tell warning tales about, woods we build through; like all the best monsters these are warnings. Finally, special mention should be made of ‘INCARCERATION’ – in which a very lightly disguised Rachel Whiteread is done in while at work in her studio by a force she has accidentally trapped in a mold, very like those the actual artist made for ‘Ghost’ and ‘House’; whether by intuition or knowledge, Freeman exactly references Whiteread’s recursive method in the slow emergence of the monster: the most dangerous thing we do, is artful.